Feadship creates history by launching Savannah, the world’s first hybrid super yacht. In an effort to combat climate change, the world has been undertaking a slew of measures. Now, Feadship has launched the world’s first hybrid super yacht, Savannah. It runs on an eco-friendly blend of single diesel engine, three gensets, batteries, propeller, azimuting thruster and a streamlined hull shape. This combination allows economies of 30%. Other highlights of this bespoke super yacht is its very form of a floating superstructure, an underwater lounge, the ‘open’ aft deck areas, and more. Savannah is inspired by the 2010 Feadship Future Concept Breathe and has a dynamic hull shape with a very fine entry. It uses one efficient medium-speed Wärtsilä main engine instead of two higher-rev diesel motors, a single central propeller shaft installation on the centreline and three gensets. A large contra-rotating and azimuthing sternthruster is fitted just aft of the main propeller. The design of the aft ship allows for a propeller that is 40% larger than the norm. Combined with the power supplied by the thruster, the load on the propeller is only half that of a conventional twin screw yacht, which again results in higher efficiency and fewer vibrations. The large sternthruster also ensures excellent manoeuvrability in marinas. “It is not the individual technologies used on Savannah that are new in the yachting world – it is the way they have been combined,” commented the owner’s project manager, Ted McCumber. “Feadship has leveraged on all the options available in the marine industry today to bring this hugely innovative system to completion. The possibility to choose between diesel, diesel-electric or fully electric is truly exceptional. Moreover, Savannah is the first yacht in the world to be running with an azipull and a variable pitch propeller,” said McCumber. 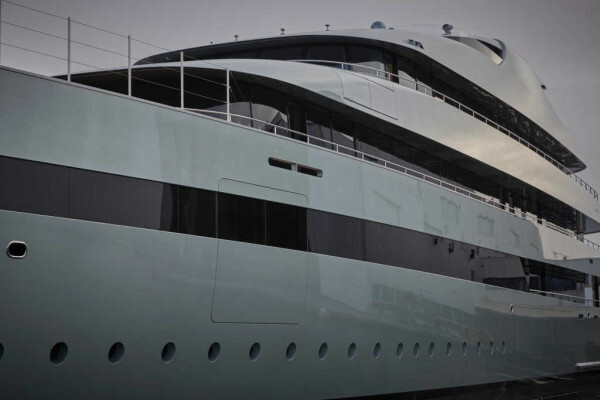 The exterior profile of this 83.50 m yacht has been created to give the impression of a ‘floating superstructure’. Crafted in partnership with CG Design, the yacht’s glass and composite panels appear to float due to a complex visual trickery involving polished stainless steel strips, aluminum supports and teak. The stainless steel doors form part of the yacht’s continuous line and also seem to be floating. The exterior colour scheme is Sea Foam metallic green. Savannah is also the first super yacht to be entirely metallic painted (including the ceilings and fixed deck furniture) with the exception of the mast domes. The aft owner- and main deck areas offer a single giant open inside/outside spaces, enclosed within weather-tight sliding doors. The sides of the main lounge are open, allowing the entire space from the swimming pool to the salon to provide an al-fresco experience zone. Among the highlights of Savannah is an underwater lounge at port side where guests can view the fishes outside or turn around and observe the fun and games in the nine-metre swimming pool. The room also converts into a cinema, which is another first for a super yacht. Savannah features an owner’s stateroom, four large guest suites and one VIP stateroom with a balcony. It also offers excellent facilities for her 26 crew members. Savannah will be made available on an exclusive basis for occasional chartering. Interested parties should contact Feadship Charter directly via +1 954 761 1830 or email them at charter@feadship.nl. Tagged Big Boys' Toys, LifeSpice, Luxurious lifestyles, luxury, yachts. Bookmark the permalink.